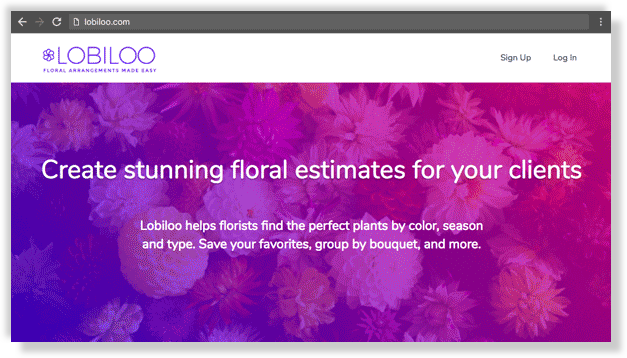 this month my fund acquired Lobiloo, a software platform that helps florists visualize estimates and quotes for their clients. i met the original founder Emily through FE International, an excellent M&A firm that connects buyers and sellers. a talented floral designer, Emily launched Lobiloo 4 years ago to help others like her convey their visions for clients’ floral arrangements. besides buying girlfriends a rose or two or three, i know little about flowers. but i do know one thing about event planning, having performed or organized more than 100 concerts, PR stunts, comedy shows, casino nights, and more. event planners are passionate about outputs – experiences. Lobiloo accelerates the negotiation aspect of floral event planning, saving designers hours per estimate, for just $29 bucks a month. in the future, Lobiloo will solve for issues with logistics, vendors, and permits too, but more on that later. the home page and in-app experience look dated. it’s hard to find various ‘save’ buttons, and core features are not mobile-responsive. Lobiloo’s new marketing message is succinct, emphasizing singular calls to action (log in, upgrade, etc). after deploying our new interface, we’ll hack on a litany of feature requests. to pull this off, we’re very careful in selecting projects built in Rails, our tech stack specialty. the frontend is Angular, which i’ve never used before, and the hosting is via Engine Yard / Amazon Web Services, with which i have a tiny bit of experience. i’m taking online tutorials to scale my knowledge of Angular, and should be able to build new features within a few weeks. Lobiloo achieves signups organically, daily, via high ranking on Google Search and referral links from other event planner resources. after implementing new designs and new features we’ll invest further into SEO, blogging, partnerships, and a customer referral program. if reading this encourages you to do what i’m doing, awesome. Lobiloo is the first acquisition in the Fork portfolio, and i’m excited to scale it over the next 24 months before finding it’s next home (buyer). to learn more about my process or to get involved in future deals, tweet at me.